These promotional kits are not only functional but stylish too, and when you start to add your brand details, you create a product with instant appeal. Whether your recipients keep them in their office or take them home shouldn’t really matter. 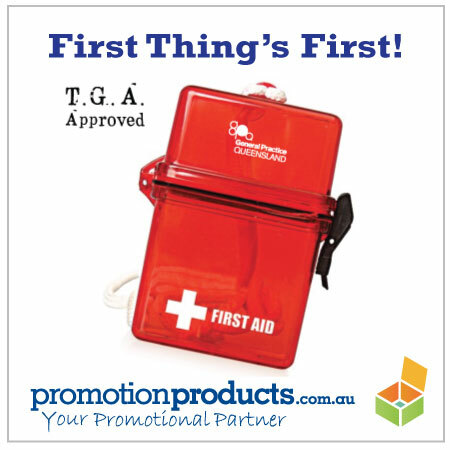 Promotional First Aid Kits aren’t paraded around like a promotional bag or cap….they come into their own in times of trouble and distress (well, wouldn’t you be distressed if you needed a bandage?! This writer and blood have a distant but essential relationship). It’s those moments when you satisfy a need that your brand or company or organisation gets recognition for the part it plays. What’s the magic formula for a love story? Oh yes, take a couple, force them into a position of jeopardy…and BADA BING! This entry was posted in business gifts, Desk and Office, Grooming and tagged catering, safety by admin. Bookmark the permalink.